I was taught and everywhere in the tutorials is written that after the normalization it is preferable that the curves look the same. However, if we have two conditions, one where is nothing expressed and another where all genes are highly expressed then according to this logic I can lose all significant expressions because the curves will look the same. What should I consider instead? Should be the shape the same and it is ok if the some curves are higher and anthers not? There are a lot of different normalization methods, which one(s) are you referring to. BTW, most methods aren't appropriate to cases where there's a global change in expression. I was looking at the normalization for RNA-seq used by DESeq2 and edger where they correct with the sizeFactors. but what is wrong with this curves? Do they really have to be all the same regarding shape, height? How can I know if a new transcript was assembled in a specific or both conditions in merge GTF file? 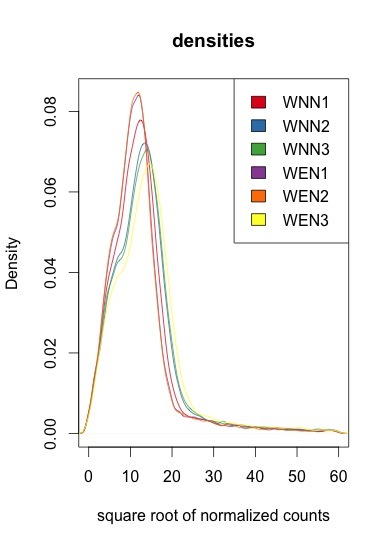 What kind of distribution to you expect to see for RNA-Seq expression levels? The shape of my ... enrichment profile !? Best values to use for a heatmap comparing conditions comprised of biological replicates? Is LOESS normalization done to each sample independently?